what it takes to get maximum exposure for your film. Our approach is to understand every films DNA before designing a trailer & poster that will capture the imagination of the audience it’s designed for. We’re passionate about great ideas, devoted to communicating the most compelling story and love getting audiences excited. Every movie production company wants to see the best results for the motion pictures they release. Success in this business is not only measured in financial terms, but also by how many lives we can affect with the story. Making money is what keeps us all in business. Winning hearts and minds is what makes it worthwhile being in business in the first place. The first step in this process, as the head of any film production company should know, is to create a compelling trailer for your film. First impressions are the vital ingredient in any business venture. Most of the time, the first impression someone will get of your movie will come from the trailer for that movie. Other times it may come from a review or from seeing people talk about the movie on the Internet, but in these cases what will most often happen is the individual will seek out the trailer of the movie to see what all the buzz is about. Great movie trailers create great first impressions. This industry is so competitive. You can’t afford not to have a powerful trailer to represent your film. Your movie trailer advertising is what helps you get noticed, and even more importantly, it is what gets people talking about your movie. Creating a quality trailer is an art-form in itself. It may seem logical for a studio to create its own trailers internally, but even most of the major Hollywood studios don’t do this. There is a good reason, and that is reason is because it’s extremely hard to be objective about your own work. As a producer, director, or even a writer, you will have your own favourite scenes from the movie, and that will influence your choices. The problem is that the scenes you love the most are not necessarily the best ones for pulling in an audience. Plus we don’t show entire scenes in a trailer, just selected segments from various scenes. There is, however, nothing random about the selection of these segments. They are selected for their power to influence viewers toward the psychological goal. This goal is always to create desire and anticipation. It should not be just that the audience is interested in seeing your movie, but that they can’t wait to see it! Put your potential viewers on the edge of their seats with anticipation by giving them the best possible taste of what your movie is all about. The only way you can do that is with a compelling trailer made by a professional film trailer company. We are more than just another movie trailer company. We are specialists in movie trailer production, with a strong record for visual excellence that generates real results. Our trailer producers are skilled directors and editors who also understand the psychology of motivation. They will deliver precisely what you need, so you get the maximum chance of influencing an audience and building anticipation for your film. That is what helps The Solid State stand out from other trailer production companies, and why you should choose us to develop the trailer for your feature film. At The Solid State, we tell stories that build audiences. We specialise in trailer production, film promotion, film marketing and movie trailer editing & producing. At The Solid State, we’re specialists at marketing your film for maximum impact. Over the past 10 years we’ve helped countless films reach box office success and critical acclaim. Our specialists can help you deliver World Class assets for every element of your film’s campaign. 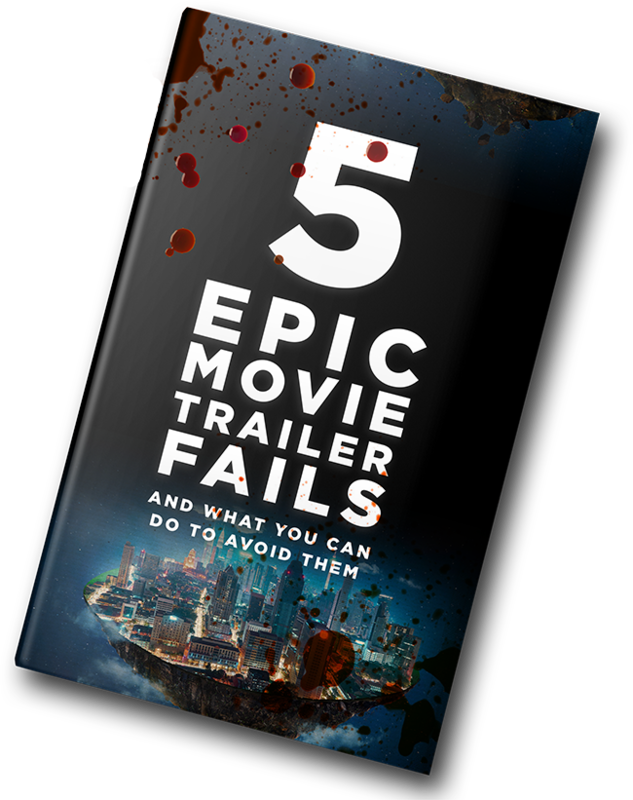 Download your free copy of our eBook ‘5 Epic Movie Trailer Fails and What you can do to Avoid Them’. It’s full of valuable information that we’ve gathered over a decade in the industry, cutting hundreds of trailers. We’re fiercely proud of the quality of our work and the incredible impact our trailers have on the marketability of a film. That’s why we back our trailers with a ‘perfect cut’ guarantee. In short, if you’re not thrilled with the first cut of your trailer, we’ll deliver you an alternative approach within 24 hours or give you a full refund. Plus, we’ll also perform a competitor analysis to see how you stack up against other movies and give you concrete suggestions on how to position your movie for the best possible results. This is 100% obligation and cost free. Ready to work with the best trailer house agency in US? Simply fill in the form below and we’ll be in contact within 24 hours.